Job interviews don't have to be dry and boring. In fact, they shouldn't be. It's important to act professionally, of course, but it's also important to show your personality to the interviewer. However, you don’t want to go overboard – this isn’t a party or family affair. Read on to learn how to show your personality at a job interview. Employers want to know that you are qualified for a position, but they also want to know how well you’ll fit in with the company culture. The only way to assess this is to get a sense of your personality. Thus, the more personable you are and the more you connect with the interviewer, the better your chances of being selected for the job. How important is personality? 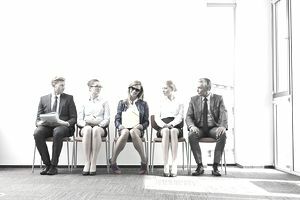 An Accountemps Survey stated that 79 percent of chief financial officers (CFOs) interviewed said an employee's sense of humor is important for fitting into company culture. That said, there's a fine line between being engaging, amusing, and overdoing it. Come prepared and relaxed. By coming into the interview feeling calm and collected, you will be able to focus on letting your personality, rather than your nerves, come through. Practice answering common interview questions beforehand to boost your confidence. Find a friend or colleague who’s willing to act as the interviewer and read the questions to you so that you can practice answering out loud. Also consider employing some relaxation techniques (like deep breathing or meditation) right before the interview. Coming to the interview relaxed and prepared will help you to feel at ease and to focus on putting your best foot forward. Greet each person you meet with a friendly handshake and warm smile. First impressions are extremely important, so demonstrate confidence right away. Stand tall, make eye contact, and give a firm handshake and a smile when you meet the interviewer. Managers want to hire people they'll enjoy working with, so show you are approachable and have a positive disposition. Be aware of your body language. After the initial greeting, you want to continue to appear confident. Posture is important so don’t slouch. Stand or sit up straight and try to avoid any nervous habits (tapping your foot, biting your nails, etc.) that could make you appear nervous and unprepared. It’s also a good idea to avoid crossing your arms, as this makes you look unapproachable. Staying calm and still with good posture is a great way to demonstrate your confidence and approachability. Don't go into the meeting looking to deliver a standup routine, but also don't be afraid to show your sense of humor. If appropriate, laugh at yourself or a funny comment the hiring manager makes, but avoid sarcasm, off-color remarks, or inappropriate jokes – this isn’t the time to show just how edgy you are. Just be friendly, witty, and personable, but don’t get too far away from who you are. And don’t forget - a genuine smile can go a long way towards demonstrating your friendly personality. Give specific examples from your past experiences when answering questions. This will not only give you a chance to support your answers with examples, but it will give the interviewer a sense of how your personality has helped you achieve success in the past. For example, describing a specific time when you successfully led a team project will demonstrate your confidence and leadership more than a hypothetical situation. Avoid negativity. When answering questions, don’t dwell on your negative experiences. For example, if the interviewer asked why you left your most recent position, don’t dwell on what you disliked about your previous job or blurt out how much you hated your boss. Instead, talk about the positive experiences you had, and discuss how you can help this company. Stay focused on what excites you about the job at hand. Keep in mind that interviewers want to see the real you and how you react under pressure. By remaining honest but polite, and by appearing composed during the meeting, you'll highlight your strengths and ability to work well as part of a team, even in trying situations. For more help, review these tips for sharing fun facts about yourself with the interviewer.